The US Mint has announced that the 2018 Breast Cancer Awareness Commemorative Coins will go on sale March 15. Six different versions will be released: uncirculated and proof clad half dollars, struck in Denver and San Francisco; uncirculated and proof silver dollars, struck in Philadelphia; and uncirculated and proof gold five-dollar coins, struck at West Point. Notably, the gold five-dollar coins are the first “pink gold” coins ever issued by the United States. The coins combine pure gold with an alloy composition that gives them a pink hue — the color that represents breast cancer awareness. NGC will honor all the Breast Cancer Awareness Commemorative Coins by encapsulating them with a special inspirational label for no additional fee. 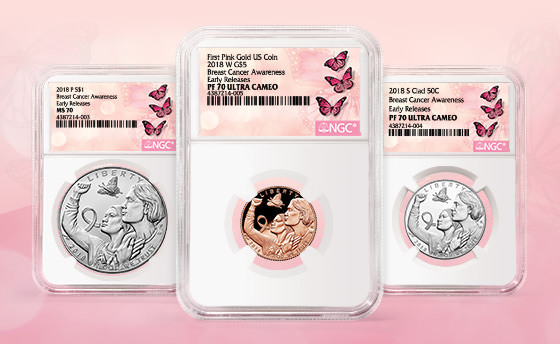 Submitters can also choose to have their Breast Cancer Awareness Coins encapsulated in NGC’s distinctive Pink Holder, which further enhances the presentation of these coins, for an additional $5 per coin.